The standard in travel guitars. The Traveler Guitar EG-1 Custom is a full 24 ¾-inch scale electric travel guitar. 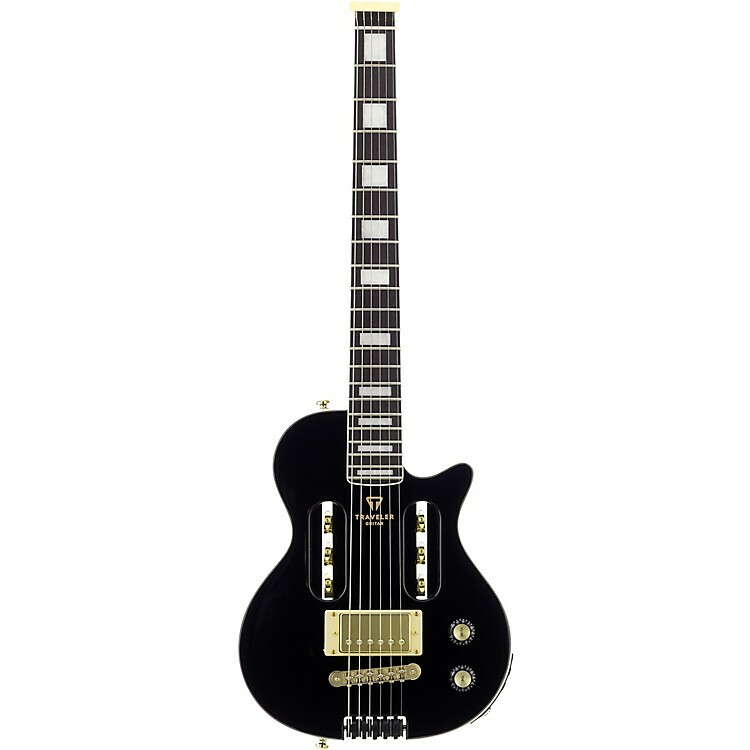 The proprietary In-Body tuning system uses standard tuning machines relocated into the body to create a guitar that has a full-scale neck, yet is substantially shorter than full size electrics. The lack of a headstock and a small, ergonomic body allow the guitar to be 27% shorter and 50% lighter than a full-size electric, all while preserving the same full-scale playing experience you’re used to. Active electronics. Plug in. Rock out. The guitar features active electronics with our proprietary 4-channel headphone amplifier built-in, allowing you to practice privately. Cycle through clean, boost, overdrive and distortion tones using the custom tap-pot and listen through your headphones or favorite amp. In addition, the EG-1 Custom includes the Shadow E-tuner, a chromatic tuner built-into the pickup ring always ready to go, so you don't need to carry extra gear. The jackplate has an aux-in so you can plug in your mobile device and play along with your favorite tracks. Traveler’s proprietary In-Body Tuning System™ uses standard tuning machines relocated into the body, eliminating the need for a headstock. As a result, you’ll have the same full-scale playing experience you’re used to on an instrument that’s 27% shorter and 50% percent lighter than a comparable full-sized guitar. The Traveler Guitar 4-channel headphone amplifier is built in, allowing you to shred at full volume without waking the neighbors. Cycle through clean, boost, overdrive and distortion tones using the custom tap-pot and listen through headphones or plug into your favorite amp. The guitar is also equipped with an aux-in so you can connect your mobile device and play along with your favorite tracks. The Traveler Guitar EG-1 Custom is the perfect solution for traveling players unwilling to compromise on scale length, and looking for a compact yet comfortable guitar. Fits easily in airline overhead compartments in the included Deluxe Gig Bag. Weighs only 4 lbs. 13 oz. Keep playing, wherever you are. Order today. Neck width at nut: 1.63 in.